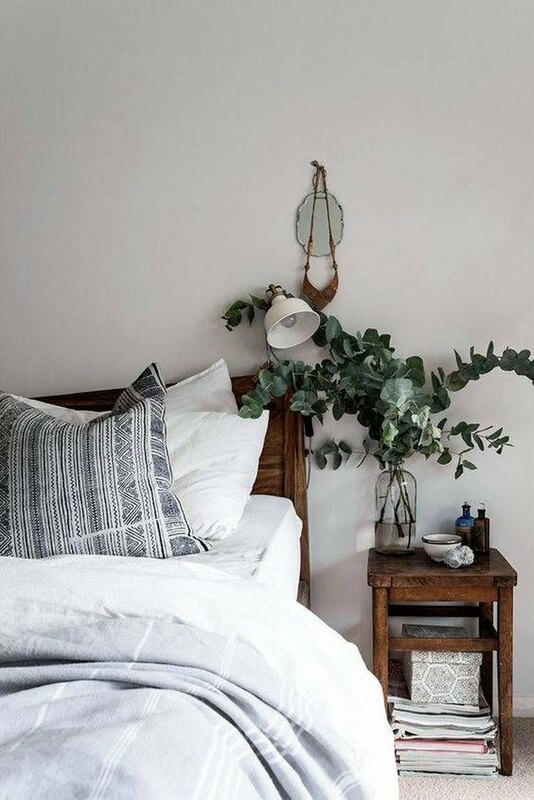 Whether you have dreams of turning your home into a chateau in the countryside or you just want to bring a bit of the simple life to your city apartment, we know just what you need to make your dreams a reality (well, for your bedroom at least!) Exhibiting material honesty and humble design, any one of these 13 ideas will bring classic farmhouse style to any bedroom, transforming your space into a quiet pastoral oasis. 1. Opt for a simple wood frame platform bed. 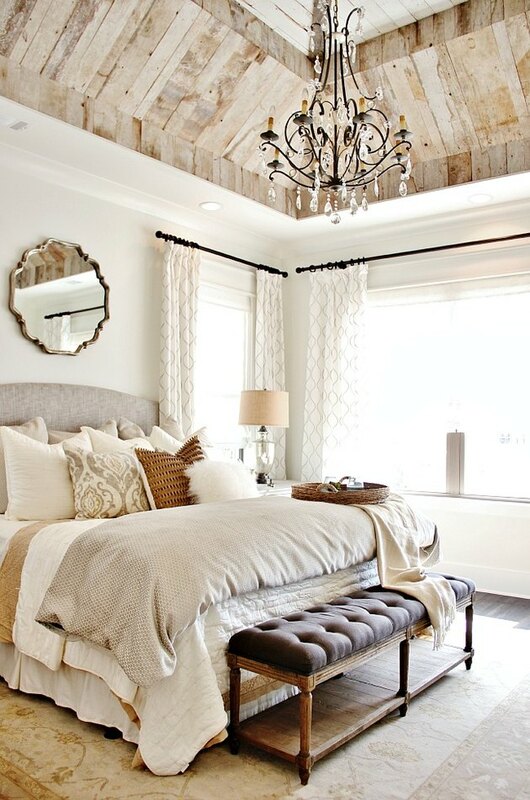 To implement a farmhouse aesthetic without overdoing it, opt for a simple understated platform bed. This bohemian option is made from sustainable mango wood and iron, which work together beautifully to create a subtle rustic vibe. Pair with a few oversized pillows and a stitched quilt to complete the look. 2. Invest in a full-length mirror. Every bedroom should have a full-length mirror, not only to make getting dressed in the morning a breeze, but this simple piece of decor will also make your bedroom appear larger than it is. And who doesn't love that? Now for the hard part — narrowing down the endless options. 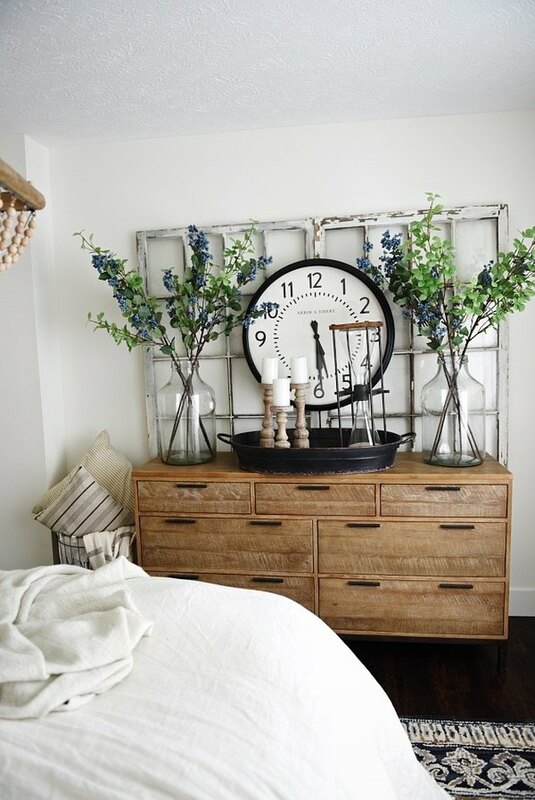 Mirrors with an antique finish prove that simplicity can be stunning, while adding a bit of vintage flair to any room. This rustic hand-painted stunner is a superb example that's sure to turn heads. 3. Catch some zzz's with eucalyptus. Ignite your senses with the sights and smells of the rustic countryside by adding a fully dried eucalyptus bundle near your bedside. Beautiful on its own, or paired with a larger floral arrangement, the eucalyptus aroma almost guarantees a night of sweet dreams. 4. Oversized woven baskets are great for storage. 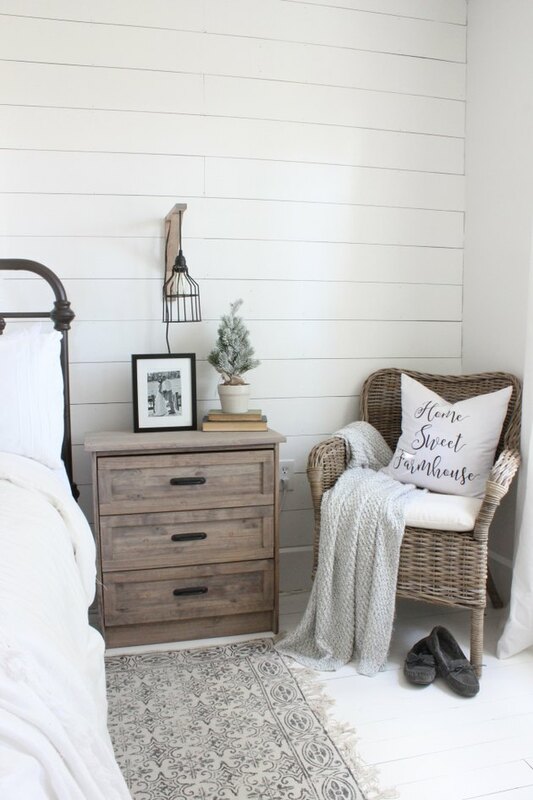 Whether you use them for storing clothes, shoes, blankets, or accent pillows, oversized woven baskets are a farmhouse-inspired bedroom's dream. A handsome alternative to monotonous plastic containers, these richly textured baskets don't need to be hidden away — which is great when closet space is already limited. 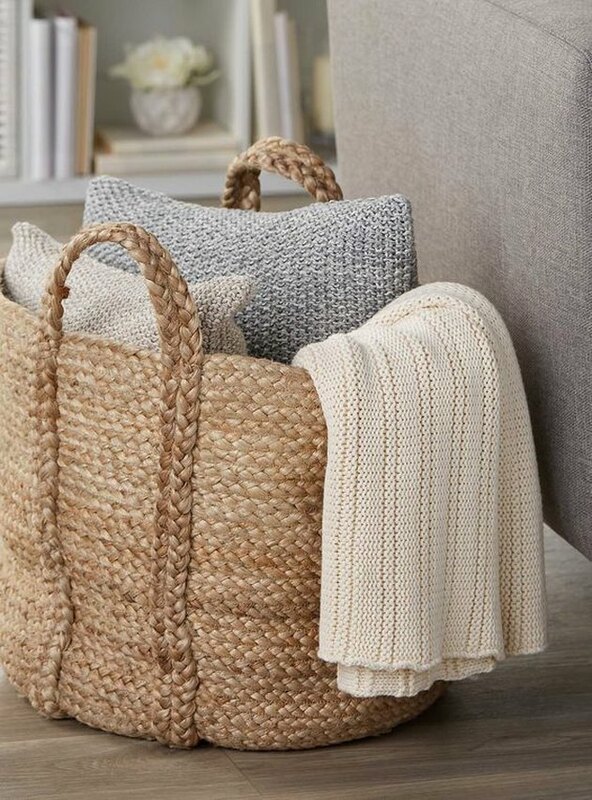 Whenever possible, opt for baskets with handles like these from Pottery Barn in order to move them around your room without breaking a sweat. 5. Add layers of texture with accent pillows. 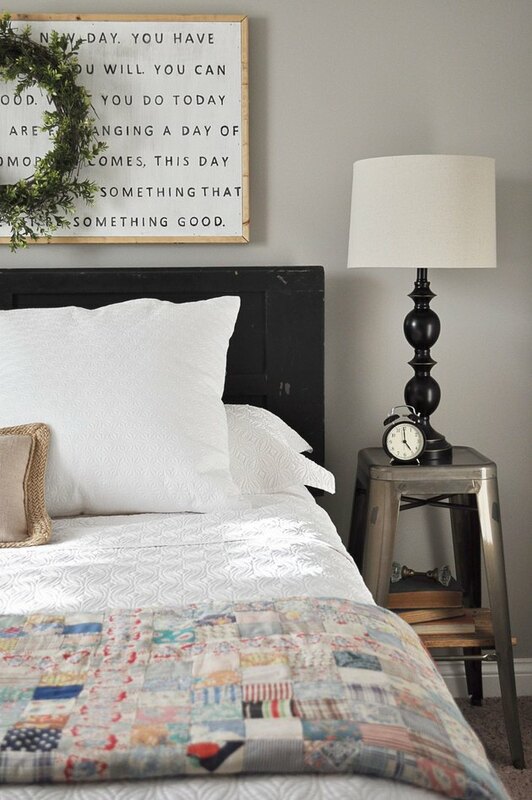 When choosing throw pillows for your bed, woven textures work best with farmhouse-style decor. 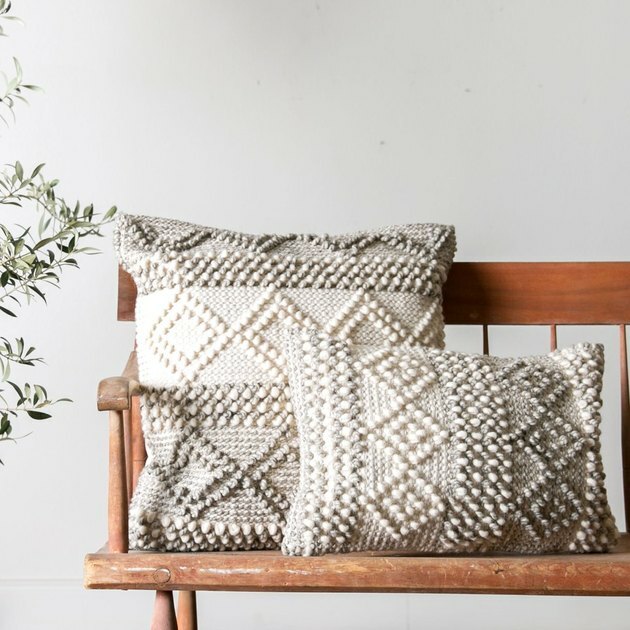 Designed by Joanna Gaines, these accent pillows from Magnolia Market have a cozy feel with a quality construction. The soothing geometric patterns and rich character make them a perfect addition to your rustic boudoir. 6. Antique-inspired rugs create farmhouse magic. 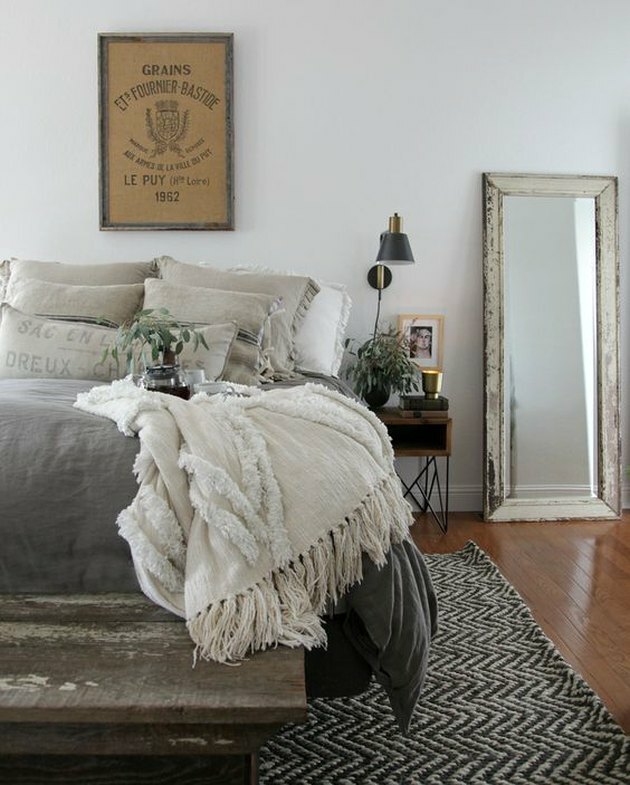 A distressed, vintage-inspired rug adds a lovely timeworn detail that is ideal for a farmhouse style bedroom. Custom made from hand-knotted wool, this gorgeous cool gray rug from Caitlin Wilson features an intricate design that provides just the right amount of style and comfort. 7. Show off your #shelfie game. What better way to display your cherished personal trinkets than on leather strap wall shelves? Our thoughts exactly — none! If you are feeling ambitious, save your money and opt for a DIY project with this tutorial from Camille Styles. 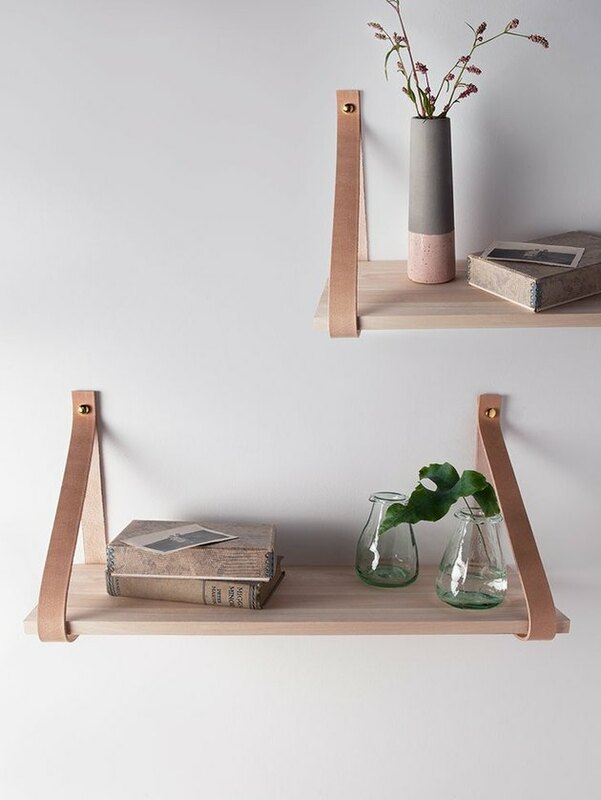 If your not feeling particularly crafty, no worries, you can also buy a similar wall shelf from Peen and Mallet. 8. A rustic, distressed finish nightstand is a must. Industrial materials, such as weathered wood and heavy metals, are fundamental to farmhouse design. 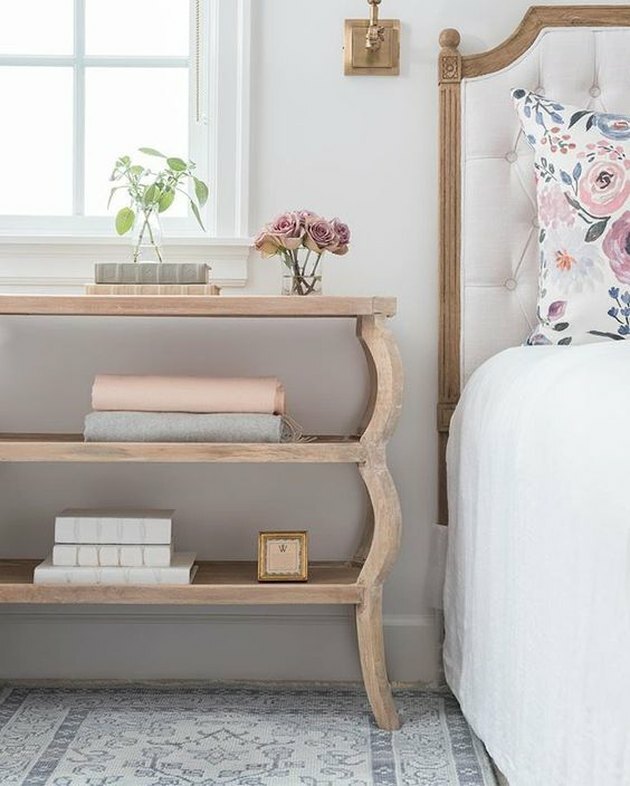 With its rustic finish and antique-bronze finish hardware, this similarly sturdy nightstand option from Ashley HomeStore effortlessly stands out from the crowd. 9. You'll be sitting pretty with a bed bench. A tufted bench with antique finish is the epitome of rustic charm, not to mention it makes a gorgeous footnote at the end of your bed. The Bella Cottage offers a similar option made from solid oak with a linen cotton blend seat cushion, which would fuse beautifully with a variety of different color schemes. 10. Store your clothes in rustic style. Handmade by Indonesian artisans, this dresser from Arhaus is made with detail in mind. Inspired by the Bauhaus era, this unique piece of furniture features a natural oak finish and a Parsons-style iron base. With seven drawers, you will need to buy more clothes just to fill them. 11. Hang a pretty wreath. Hanging wreaths is not just a holiday decor idea. In fact, it has been a homestyle tradition for centuries, spanning back to Ancient Rome. Still found in many farmhouses today, this decorative accent is a delightful way to bring the outdoors in. We just love the wild cotton wreath from Chip and Joanna Gaines' Magnolia Market! 12. Add a stitched quilt to your bed ensemble. 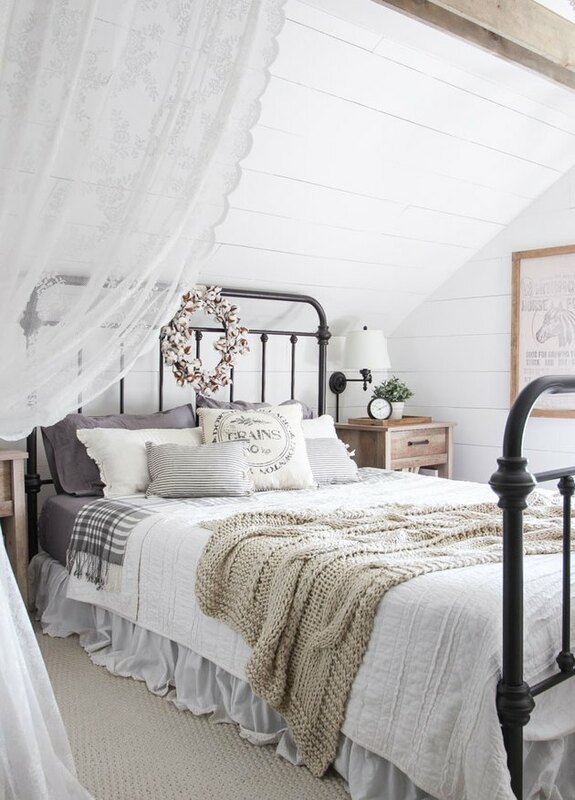 Traditional in any farmhouse, a stitched quilt is a great way to bring character and a handmade vibe to your bedroom. 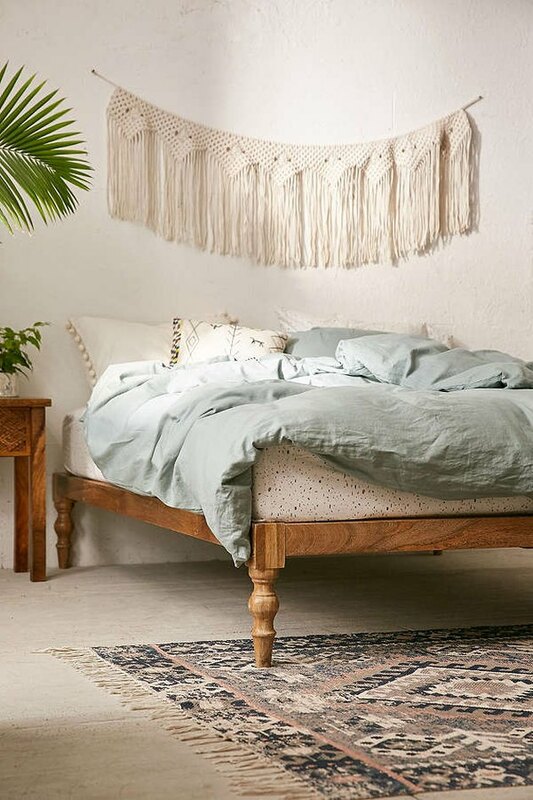 Charming and practical, the Linden Quilt from Anthropologie is a great option that features conventional motifs and floral patterns reminiscent of antique quilts passed down from generation to generation. 13. Install open weave burlap drapery panels. Natural light is an essential part of the outdoorsy farmhouse aesthetic, but for a bit of privacy opt for drapery with some rustic charm. 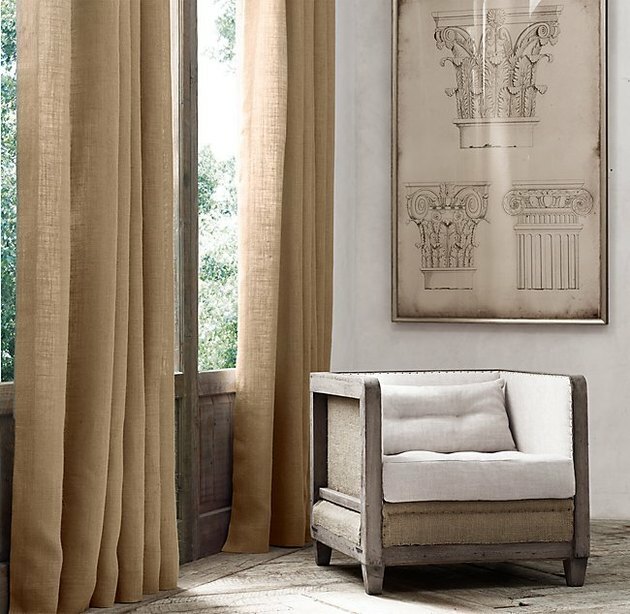 These burlap drapery panels from Restoration Hardware bring to mind vintage textures which fade over time, giving your room a more lived-in feel. In addition to providing privacy, the 100% cotton lining also provides greater light control which comes in handy when you don't want direct sunlight pouring in.